It’s time again for me to face the challenge of my co-conspirator Tony. He has once again challenged me to read more to the Hama and Silvestri Wolverine run. After I really enjoyed the last set of issues he told me he had another three issue run that was even more crazy but fun. So without further ado. particularly ritzy kinda guy”. Those are the first words in issue #35, and the story only gets better from there. As the quote hints at the story begins outside a seedy bar in Canada. where Puck has just finished forcibly removing a patron from the bar. Wolverine is looking to hide for awhile, so he is looking to old friends. While they are sharing some beverages they get to talking about old times, which leads to Puck showing around a picture of himself in WWII with some famous people. The big surprise to this is the fact that Puck is tall. On the other side of the world Lady Deathstrike is trying to track down Logan to make him pay for “stealing” her father’s adamantium bonding process. Through very rough investigation she tracks him to Madripoor, which then ties into the first arc I reviewed. Deathstrike is working with a group of people led by a character named Pierce to find Wolverine. What Pierce and the rest of the groups interest in her mission is never explained, but somehow they have talked Gateway into helping them by teleporting Deathstrike around. But he is doing it reluctantly, so they have to be careful to be clear on where they want to go or he will twist their request. 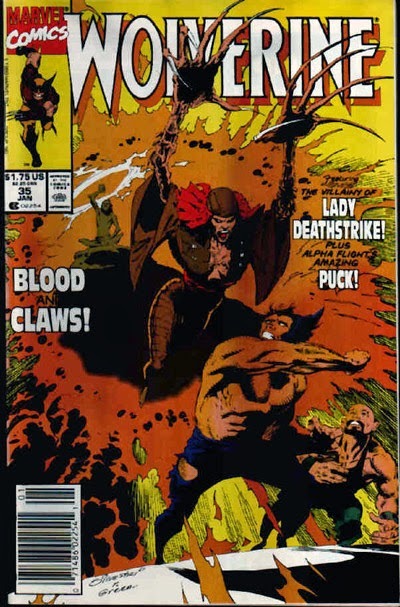 A point that Deathstrike forgets when she makes her request to be sent to “The place that Wolverine gazes upon this very moment”. The problem is that at that moment Wolverine is thinking back to the year 1937 due to the conversation with Puck. This is where the arc takes a really strange but fantastic turn. Because of the wording of Deathstrike’s request she is sent to Vancouver with Wolverine, then quickly thrown back in time to 1937. Because she was near Wolverine and Puck they are sucked into the time tunnel too. Next thing they know, Wolverine and Puck are in the middle of a bullring in war torn Spain. Puck is full grown and itching to fight a bull himself. Throughout the rest of the arc you have Wolverine and Puck teamed up with Ernest Hemingway. You read that right Ernest Hemingway. Though they never flat out call him Ernest Hemingway(they refer to him as Ernesto) it is clear that is who it is. And a female character that is part of a partisan movement in Spain. While Deathstrike is teaming up with a group of Nazi soldiers with the promise that if they help her find and kill Wolverine she will deliver her fathers process to give them “Super Soldiers”. Thus the chase is on. Throughout the various encounters Puck ends up injured which sets up the final confrontation between Deathstrike and Wolverine. Back in the present, there are effects of the possible changes that could occur in the timeline start to appear. These “time twisters” as they refer to them cause Pierce to start making moves to try to protect the timeline. He and his crew are rushing to find the divergent events so they can do something to stop the events from changing and wiping them from the timeline. Meanwhile the battle between Deathstrike and Wolverine rages on even as they are jumping through time. Their battle gets pretty brutal, often they are tearing each other to shreds with their adamantium claws. As the jumps are occurring Puck gets separated from the other two time jumpers, but continues jumping through time as the trio works their way closer to the present. To Puck the boat rocked and tossed them into the water but they never went anywhere when they are finally back in present day. While Wolverine remembers all of the time travel trip they went on. Back in Australia Deathstrike gets informed that she is being taken off of the mission of trying to kill Wolverine, and being replaced by a mindless clone of Wolverine and some young girl in a tank. 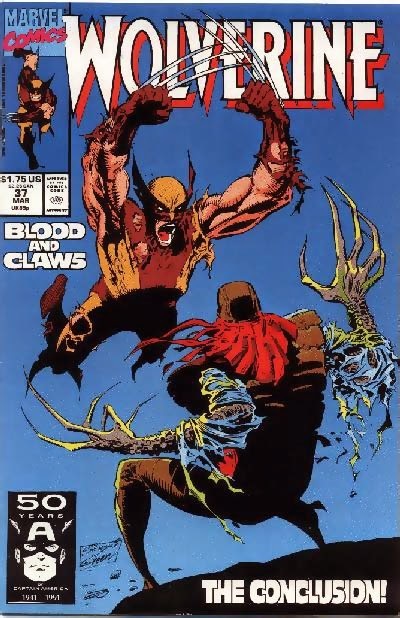 As in the previous arc I reviewed, Hama and Silvestri do a great job with Wolverine. Making him a strong and compelling character. But it is their handling of Puck that really makes this arc great. Puck is one of those characters that isn’t very interesting most of the time. But every once in a while a writer comes along that knows exactly how to write him to make him work. And when he is written well it makes for a lot of fun for the reader. I really enjoyed this arc. between the time travel, the supporting characters and the potential effects of this arc on the greater story of the title, this arc was really unique. After reading two arcs of this run on Wolverine, I am interested in trying to read all of the rest of the Wolverine issues that Hama and Silvestri did together. Thanks for reading my review. As always I had a lot of fun writing this review. If you have any comments or suggestions please contact me through the comments section. Till next time. Keep on reading and enjoying those comics people.